Total Intestinal & Digestive Support! 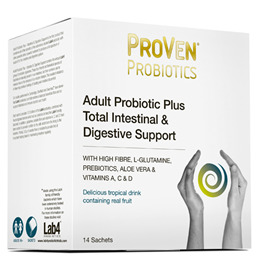 ProVen Probiotics Adult Probiotic Plus Total Intestinal and Digestive Support is the first product that combines all of the benefits of the extensively studied Lab4 probiotic with other powerful nutrients to produce a full spectrum of support for the intestine and digestive system. A tropical drink containing real fruit. Lactobacillus acidophilus (CUL-60), Lactobacillus acidophilus (CUL-21), Bifidobacterium bifidum (CUL-20), Bifidobacterium animalis subs p.lactis (CUL-34) - Containing 12.5 billion viable cells. SunfibreAG™ (Partially Hydrolysed Guar Gum), Inulin, L-Glutamine, Fructooligosaccharides, Xylitol, Ascorbic Acid, Corn Maltodextrin, Pineapple Juice Powder (3.1%), Mango Pulp Powder (3.1%), Potato Maltodextrin, Lab4 Probiotics (Lactobacillus acidophilus CUL-60, Lactobacillus acidophilus CUL-21, Bifidobacterium animalis subsp. lactis CUL 34, Bifidobacterium bifidum CUL 20), Acacia Gum, Sucrose, Aloe Vera 200:1 Extract, Sweeteners (Stevia Extract, Sucralose), Corn Starch, Anti-caking Agent (Silicon Dioxide), Flavours (Natural Pineapple, Natural Mango), Medium Chain Triglycerides, Retinyl Acetate, Propylene Glycol, Corn Oil, Antioxidant (DL-Alpha Tocopherol), Citric Acid, Vitamin D3 (Cholecalciferol), Preservatives (Sodium Benzoate, Potassium Sorbate). As a food supplement dissolve 1 sachet into a glass of cold water or juice and take either just before or just following a meal. If required, two sachets can be taken per day. 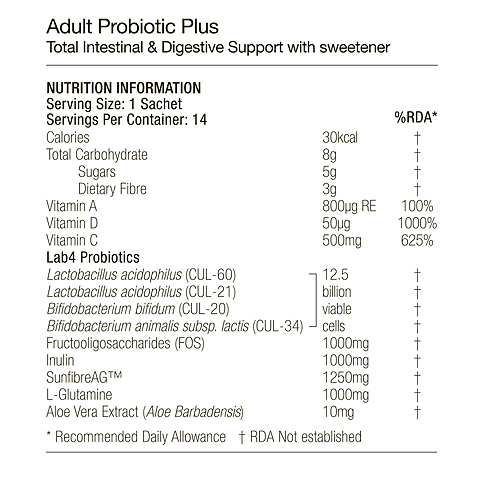 Below are reviews of ProVen Probiotics Adult Probiotic Plus- Intestinal -14 Sachets by bodykind customers. If you have tried this product we'd love to hear what you think so please leave a review. As I suffer with IBS-C(constipation) I found this probiotic made me extremely uncomfortable and aggravated the symptoms. Expensive and not pleasant to take however probiotics react differently from one person to the next. Perhaps I did not take them long enough but my IBS was too painful. I found this product did nothing to relieve my symptoms. I took only four sachets out of the pack. I am still trialling probiotics that suit my needs. 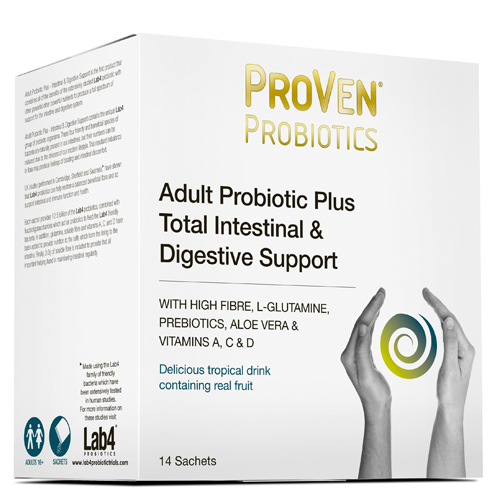 ProVen Probiotics Adult Probiotic Plus Total Intestinal and Digestive Support combines all of the benefits Lab4 probiotic with other nutrients to produce support for the intestine and digestive system. A tropical drink containing real fruit.